Read, Write & Recommend It: A Blog for Crestview Students to make Book Recommendations to each other and the world! 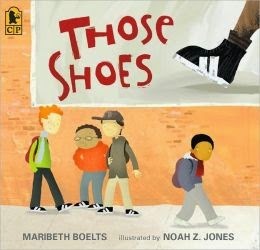 This book is about a boy named Jeremy who really wants a new pair of shoes. The shoes he wants are ones that many kids in his school have...black ones with two white stripes. He wants them so bad, but unfortunately his grandma can't afford them. He ends up finding them at a thrift store and gets them. However, Jeremy finds out that maybe someone else he knows could use the shoes more than him. My favorite character is Jeremy. He is a very kind boy. He learns to care for others that are in need. My favorite part is when Jeremy does something with his shoes that helps another character in the story. You should read this book because it teaches a very good lesson: help others in need and always be kind. This book makes me think of students at Crestview. Many of the students at Crestview are always helping each other, just like Jeremy in the book! This book will make you happy! You should read this book because it teaches a very good lesson: help others in need and always be kind. This book will make you happy! Submit your own recommendation here! Click here to Recommend A Book! 5. Type your first name only.